time and ongoing maintenance on your towers. Just like a car, cooling towers need maintenance at scheduled intervals or you risk potential catastrophic failure. Should you need service on parts or repairs, Midwest Machinery works on all makes and models of towers, factory assembled or field-erected. 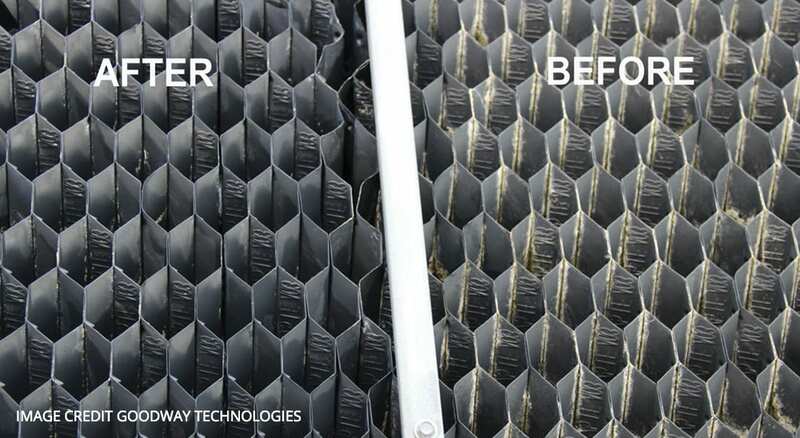 Scale and algae buildup, brittle from UV attack, corroded supporting tubes, and ice damage are only some of the conditions that affect your fill and the cooling tower efficiency. 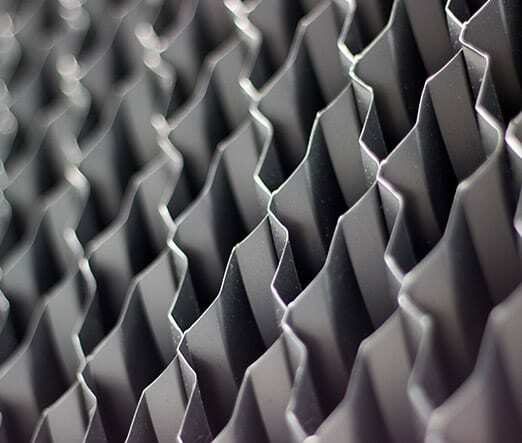 Typically, service of PVC fill media is required every 10 to 15 years. Cooling towers galvanized collection water basins can accumulate silt and sludge, and can be damaged by corrosion and chemical attacks that deteriorate its walls. In the best scenario, a cooling tower basin lasts for 15 to 20 years without requiring a basin coating. Oil level, leaks and quality, backlash issues, endplay inadequacies, deposits outside of the case, and tightness of all the hardware connecting the Geareducer to the support have direct impact on the cooling tower performance. Geareducers should be examined every 3 to 6 months. 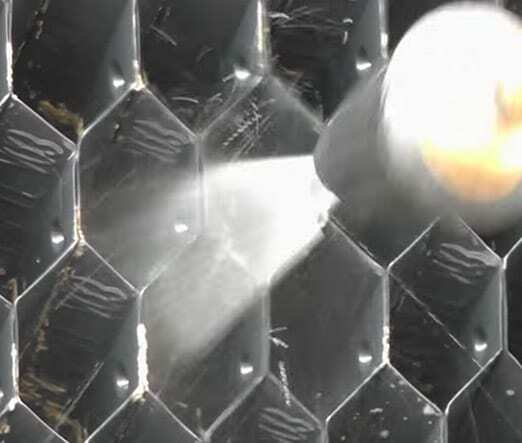 Nozzles can get clogged and present normal signs of wear or loss of material as consequence of corrosion or erosion. 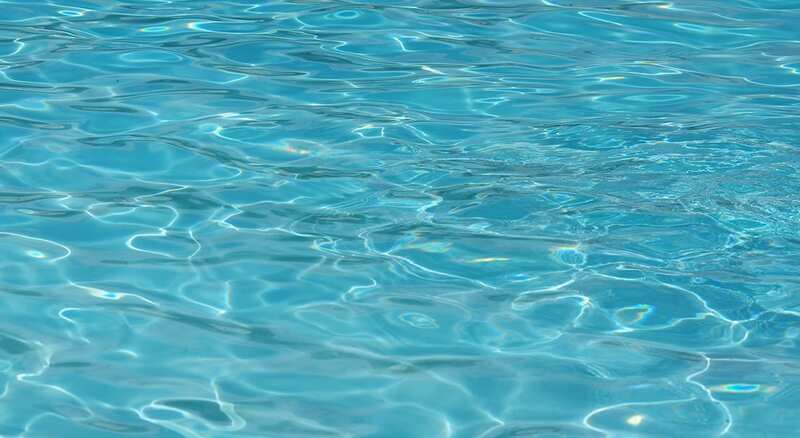 Maintenance procedures include checking if they are in place, working properly, and correctly connected to branch pipe or distribution basin floor. Debris in the air passages of drift eliminators, bad seals conditions, UV attack, and frames and components improperly installed will affect the airflow of your tower, decreasing performance. Drift eliminators should be checked every 6 months. Corrosion and erosion in fan blades or broken and missing blades, bad connections between the blades and hub, and the tightness of the bushing between the hub and shaft can cause more problems than just vibration. Tech support is necessary not only for fans, but also for the fan deck and the fan cylinders. Louvers need to be in place and have no signs of deterioration of the base material, or scale buildup and biological growth. Louvers supports need to be in good condition, and the connections between the louvers and the tower need to be constantly observed. ACB louvers are supposed to be replaced every cooling tower startup. The tower structure is important for safety purposes. Wood decay and steel corrosion on the stairway, or loose treads, handrails, or deteriorated stringers could potentially cause accidents. Tightness of bolted connections and hardware condition and welds need to be verified on a regular basis. Regular cleaning and quality water will dramatically prolong the life of a cooling towers. 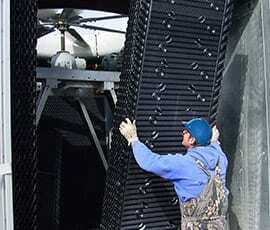 We can advise or service any cooling tower to maintain maximum longevity in the field. It is important to understand that scale formation on a cooling tower fill is the natural occurrence of a tower operation, which means that in moderation it will not affect the performance of the equipment. Salts and debris that are inside the water stay behind due to the fill and the louvers, and that is good sign, meaning that your tower is performing as it is supposed to. However, cooling tower fill must be cleaned twice a year in order to control the scale buildup. The fill is the heart of a cooling tower, and excessive scale can obstruct water passage and cause the equipment filter to clog, eventually causing the equipment failure. In crossflow towers the water flows vertically through the fill while the air flows horizontally, across the flow of the falling water. 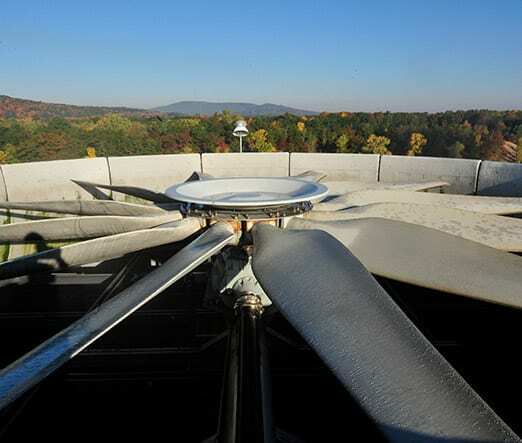 Cooling towers attract all kinds of airborne debris, and potential contaminants that enter the cooling tower are the ideal environment for bacterial growth and the formation of biofilm. Biofilm in a cooling tower is one of the biggest concerns in our industry now, because of its contribution to increased levels of legionella, a bacteria that lives in hydronic systems but can be deadly dangerous if not under control. 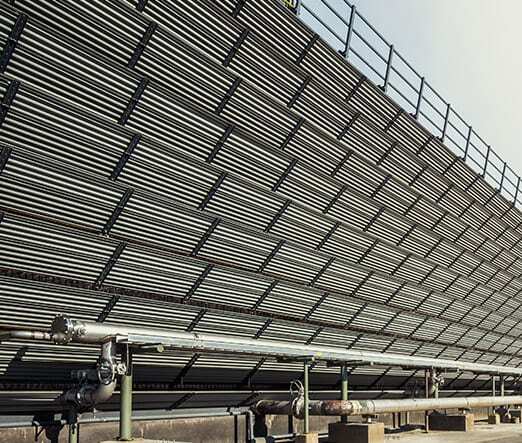 There are several types of cooling tower water treatment solutions available in the market, and they can be either chemical or non-chemical. Regardless of your option, having an efficient water treatment program will not only prevent bacterial growth, but will also increase the lifetime of your equipment. We've been repairing towers for almost 100 years. Rest assured, we've seen every scenario you could throw at us and we'll get the job done right the first time. This guide will help you perform a thorough inspection on virtually any cooling tower. 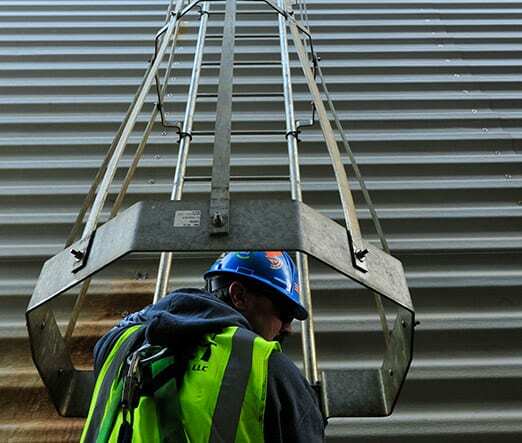 The tips and checklist in this file will allow you to plan your cooling tower repair and maintenance and reach maximum safety and efficiency. Did you know that the frequency and amplitude of cooling tower components’ vibration can provide insight into the machine’s condition? Vibration monitoring equipment assist in maintenance forecasting as well as in preventing further damage to machinery and components. Learn more. Water quality is essential to determine the performance of a cooling tower. 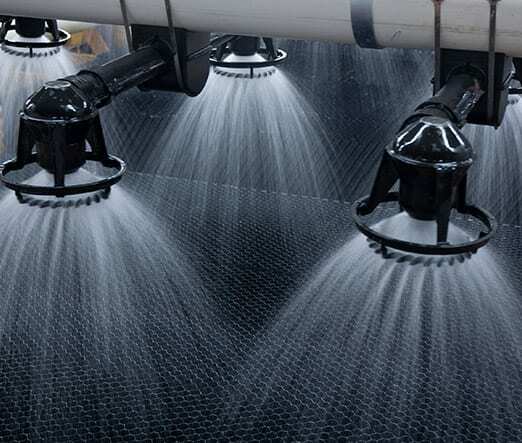 The correct water treatment will eliminate the risks caused by airborne debris and prevent biological growth, slime, calcium build up, and white rust. Click to see the presentation.